I asked two friends, Emilia and Marlene, for help in developing an English Muffin Recipe for the first in a few more #fromscratch challenges. This single challenge was more daunting than expected. There’s not much out there in the way of English muffin recipes, and the ones we found were lacking and even our original attempts weren’t appealing. I first had a look at Jane Grigson and Elizabeth David, returning to the source of English muffins, just called muffins, of course, along with their sibling, the crumpet, which should have holes in the surface. Both recipes used what amounted to a standard 5:3 bread ratio that was cooked on a griddle. Marlene worked with a buttermilk version for flavor. We had issues with the proper amount of holelyness, important in a good English muffin. Ultimately we went to Emilia’s husband, who’s mum is from Dover and has strong feelings on English cookery. The below English muffin recipe is based on her simple preparation. The key word is simple. These are humble creations, made on a griddle top, and we wanted to keep it that way. Elizabeth David noted one source in 1908 that called them so old-fashioned as to be nearly obsolete. All the more reason to make them yourself at home. The ones we’re offering here hew to English simplicity, are enriched with butter and egg and use baking powder at the end to ensure a bubbly interior. Be sure to cook them all the way through over moderate heat. They can be finished in the oven if you want to make sure they’re done. They can be eaten shortly after you take them from the heat. If you toast them (a tradition that began apparently because leftover muffins became dry and tough and so were toasted to make them more palatable), and I think you should do this for flavor, open them with a fork rather than a knife which increases the surface area. Notice this recipe uses equal parts by weight flour and liquid, virtually a pancake batter but with less egg and lots of yeast. It also contains butter and egg for richness as well as the addition of some baking powder added at the end for a more holely crumb. I like the appearance of free form muffins. If you like them uniform, then use English muffin rings. I don’t have these rings, but I do have taller rings. But this made flipping them trickier; I had to cut them out of the ring and press them down onto the griddle. All methods work. What I recommend if you have rings is to start them in a ring so that you get a fairly uniform shape, then lift the ring and allow it to cook as it will. Combine the butter and sugar in a small sauce pan, stirring to dissolve the sugar. Add the milk, stir it and remove it from the heat. Stir in the yeast and the egg. Combine the flour and salt in mixing bowl. Add the milk mixture and stir till it’s all well combined. Cover and set aside for 1-1/2 hours, or refrigerate overnight (removing it from the fridge an hour before cooking). Heat a griddle or a skillet over medium heat. If you’re using rings, butter them. Stir the dissolved baking powder into the batter. Dust the griddle or skillet with corn meal. Scoop-pour about 1/4-cup portions onto the griddle, free form or in rings. Cook for about seven minutes. Flip them and continue cooking till done, 7 to 10 more minutes. Allow them to rest for at least 10 minutes, pry in half with a fork, toast and serve with butter, honey, or jam, or beneath Canadian bacon, poached egg and Hollandaise sauce. Note to intrepid bakers: We made these with conventional yeast, but they would be awesome using sourdough starter. If anyone wants to amend this recipe using starter, send it to me and I’ll add it to this post! haven’t, which book is it in? Here’s a review of the alton recipe via google. I have been making this recipe for several years (http://www.kingarthurflour.com/recipes/breakfast-sandwich-muffins-recipe) and love it. Biggest difference appears to be the addition of baking powder in your recipe. What is the powder bringing to the table? I have never thought to make English muffins or crumpets. I enjoyed them growing up with fresh preserves from my grandfather’s garden. Unfortunately, my diabetes does not like crumpets or English muffins, except in small little bits. I will keep this recipe in mind for when company comes over though. If you will excuse me, it is now time for my tea! Jason, there is nothing wrong with one English muffin (of course no preserves allowed)….but who can eat just one? I made Peter Reinhart’s muffins but somehow I made the dough too dry. I want to try his again, and I will also try this one. I do love English muffins! 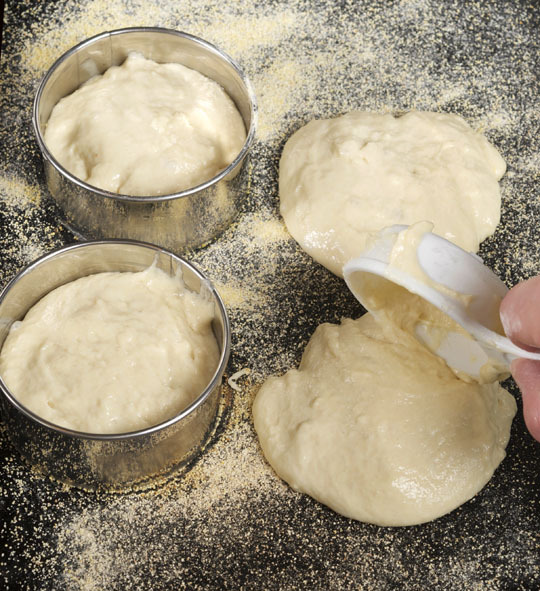 Reinhart’s recipe in Artisan Breads every day calls for baking soda to be folded into an aged batter just before cooking. It works pretty well. I tested with baking soda, Michael tested with baking powder. I don’t think there was a noticable difference between the two, but they need one or the other for the holiness! I’ve never come across a recipe for English muffins and I’ve always wanted to make them from scratch. Thank you for this recipe and for the very helpful tips for their preparation. I had a real yen for crumpets one day–went out & bought griddle rings & whipped up Beard on Bread’s recipe. They were a massive failure & I still don’t know where I went wrong. The dough was way too thick & tasted like thick pancakes gone wrong. Didn’t even vaguely resemble crumpets. So I whipped up another batch, this time thinning the dough. These were simply thin pancakes gone wrong. Wish someone would come up with a decent recipe. There’s a lovely little crumpet shop on 1st Avenue just outside the Pike Place Market in Seattle. When I lived closer I used to go occasionally. I’d have their Green Eggs (scrambled eggs & pesto on a toasted crumpet) & buy some crumpets for the freezer. I think I need to go again. Hope the shop’s still there! Makes a whole loaf of muffins in one shot. Those English muffins look great. I’m going to experiment with this tonight. Thanks for posting this recipe. Any of you folks who try the recipe, pls report back with results, good or bad! I tried out your recipe– as far as shape and even flavor were concerned, it came out beautifully. But somehow the yeast smell did not go away, which made it slightly unpleasant to eat… maybe I did not cook the muffins long enough? Do you foresee issues with the heated butter/sugar from Step 1 killing the yeast? Or will the milk cool it enough not to kill of the yeast? I just wanted to check in with that since it wasn’t too clear in the recipe. Awesome recipe, looking forward to experimenting with it! A question: I am told that you can’t get the nooks and crannies using real milk, that you need to use powdered milk which I can’t get where I live. But your muffins look like they are full of them. Am I right? How would they compare to say? Thomas` in terms of nooks and crannies? I know this may sound wierd, but those holes are the reason I like English muffins. When in London, the muffins were smooth and dense, I hated them. And finally, do you think fresh yeast would work? While I love to bake, current home logistics don’t encourage it. So forgive me for asking if you’ve tried Bay’s whole wheat English muffins. White flour is not my friend. I’m surprised we have Bay’s here and I’m not familiar with them, but I’m hoping to learn that the whole wheat will not be disappointing. Anyone? and p.s. yes I do realize you don’t like Thomas`. Just looking for a comparison. This is great timing. I’m planning on making eggs benedict Christmas morning. I use your Ratio recipe for my hollandaise, and wanted to make my own muffins as well. Thanks. hope you’ll cure your canadian bacon as well! Checked out the recipe in Charcuterie. I received my pink salt awhile ago, so now I have to, don’t I? haven’t tried crumpets but we need to work on that! Oh oh. I feel endless rounds of crumpets coming on! I have a stainless steel pan that I will probably use for these (can’t WAIT to try it!). I have a question for clarification: do you add butter to the pan and then cornmeal for frying, or do you just add cornmeal alone? And the cornmeal won’t burn or anything? no fat in the pan, only corn meal, and no it didn’t burn. moderate heat. you don’t want the muffins to burn either. Just in time – out of English muffins and just loaded up the freezer with home cured and smoked Buckboard Bacon (used Hi Mountain’s cure and our Big Green Egg). Any suggestions for a “Crispy, deep-fried pork belly” cure and process similar to what Melissa Kelly serves at Primo? I have 2 pork bellies in the freezer after having tried the belly this past summer. key to crispy skin is to braise or confit first, then finish in high heat till crisp. When I learned that “just seven people worldwide know the recipe and manufacturing process that give english muffins their trademark ‘nooks and crannies” (http://www.usatoday.com/money/industries/food/2010-07-29-english-muffin-lawsuit_N.htm), I had no idea Michael Ruhlman was one of them! I make mine with sourdough, there is a little yeast in the starter. They are good and disappear fast! Not really sourdough if you’re using commercial yeast as a kind of preferment. but love the look of your muffins in that cast iron pan! this recipe is more a crumpet than a true english muffin. 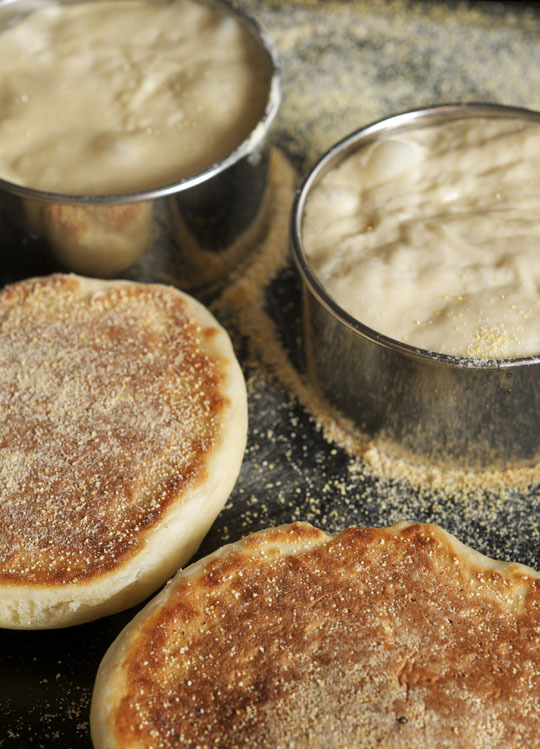 A true english muffin is cut out of a rolled out very soft dough like a biscuit, then they stand freeform on the griddle to bake. when you need a ring, you have crumpets. I have made english muffins for decades and tested many ratios when I was getting a recipe for my baking classes. There is no contest between commercial and homemade english muffins. and just a note. even one english muffin made with wheat flour can be a problem for a diabetic. There’s an American who sells whole wheat English muffins at the bio market on blvd Raspail every Sunday, and they’re wonderful — but now that I know how easy they are to make, I think I’ll stay inside, where it’s nice and warm, and make a batch of my own! Thanks, Michael! I absolutely love making bread, I’m going to give this a go! Here is where I first read about it. Never tried it since I can’t get it here as a I mentioned. But I will definitely try yours as they look DIVINE. I recently tried making crumpets through a recipe on the King Arthur website. I used egg rings. This recipe looks similar. Will definitely try this and compare. Thanks! I am afraid that I would be addicted to these if I started making them. I am surprised at how simple they look to make. There are not too many things that smell or taste better than freshly baked bread! imagine, a lawsuit over the tasteless Thomas’s English muffin. I’ve tried the sourdough english muffins from the La Brea bread book. It’s a grainy, hearty kind of dough, and it wasn’t enough of a classic english muffin for me. I’ve been wanting to try some other versions, so yours is on the list now. Thank you for your recipe. I tried the Alton Brown version and it wasn’t working great for me – I wasn’t getting the hole-y result I wanted. I bought a couple sets of those rings for my birthday last year. I look forward to giving yours a try, I think the baking powder addition will make a huge difference. Now if anyone has a good recipe for making Austrian Semmel rolls, I’d be even happier. I was there the last 10 days and got a Semmel dough recipe from the village baker, but she uses a large conveyer cutter and baking machine. I’ll try it and if it works well, submit it. Michael … to make sourdough ones just substitute a 100% (equal weights flour and water), refreshed till vigorous, starter for about 1/3 of the original flour and liquid. So, replace 4 oz. of the milk and 4 oz. of the flour with 8 oz of 100% starter. Oh dear. I know food isn’t donna’s favorite subject to photograph, but she is so good at it. 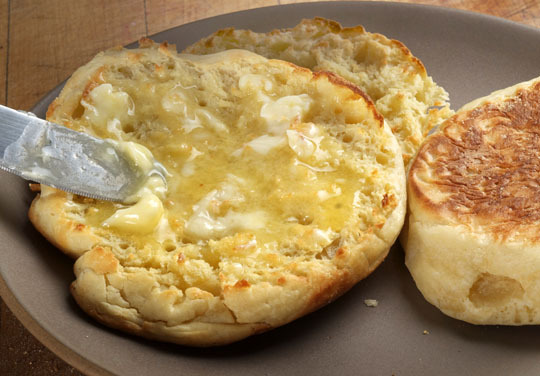 That buttered english muffin photo on top makes me want to jump through the screen, and it’s just bread and butter on a neutral-colored plate! congrats on the english muffins. We have a breakfast place here in McMinnville that makes everything from scratch including english muffins. I bet if you called the Crescent Cafe, cook/co-owner Danny would happily give you the recipe; they are to die for (but then again so is almost all things breakfast that he makes, especially his fried cornmeal, swoon). you need a print recipe function! I was wondering the other day about english muffins and how you would make them. These look delicious, and in winter cooking them on the griddle is so appealing. I’ll have to give them a try soon. Tried out the recipe and then enjoyed the results with both butter and preserves. Next time I’ll decrease my griddle temp– seemed like the second side got a bit too done before everything cooked through. Overall, nice taste and very easy to make! Thanks, Michael. Those look amazing, just like the ones my mom used to make. My company sentenced me to South Carolina about a year ago and I’m so sick of mush and dry greasy biscuits I can’t stand it. I’ll try and make some soon. BTW mom used washed tuna cans for forms. OMG, the 6th was my birthday and I was considering my next adventure in my baking world to make my own English muffins whilst at Kitchen Kaboodle in Portland, Oregon and lo and behold – the God has spoken! Thank you!! The best Birthday present! Nothing better than a fresh English muffin. The Mud Street Cafe in Eureka Springs, Arkansas serves great English Muffins. Was wondering how long these will keep and if they could be frozen. Always thought these would be difficult to make. Daughter loves Engligh muffins but all we get here are nasty Thomas and she won’t eat those. Will have to give this recipe a try. I will try your recipe! Bay’s are awesome! But these look terrific! I have been trying to turn people on to Bay’s muffins for years. Thanks Michael, I thoroughly enjoyed this. The muffins turned out really well, even with my lack of skill as a baker. My dough was definitely a dough, bearing no resemblance to pancake batter. I think I packed my cups of flour a bit tight (one of these days I will get a scale). I ended up finishing them all in the oven, as my test case got a little to crisp on the outside by the time the inside was cooked thoroughly. No rings here, free form worked fine. Ended up with 13 muffins ,which are now gone and provided a great medium for some homemade jam that my wife brought home last weekend. Just made this recipe. They turned out great! With the first few, I accidentally used 1/3 of a cup, but the rest were with 1/4 cup and they were better, but I found the best were when I used about 25% less of a 1/4 of a cup. I made molded ones using some round cookie cutters (I only had one of each size, so it was a slow process) and free form ones too. I agree that the free-form look better. They were moister and more tender than I am used to (** cough** Thomas’s). I will definitely make these again. I used them for an Egg’s Benedict dinner! The kids loved them too! Looking forward to the sourdough version. Just made this recipe. They turned out great! With the first few, I accidentally used 1/3 of a cup, but the rest were with 1/4 cup and they were better, but I found the best were when I used about 25% less of a 1/4 of a cup. I made molded ones using some round cookie cutters (I only had one of each size, so it was a slow process) and free form ones too. I agree that the free-form looked better. They were moister and more tender than I am used to (** cough** Thomas’s). I will definitely make these again. I used them for an Egg’s Benedict dinner! The kids loved them too! Looking forward to the sourdough version. I made these this morning, opting to make the batter last night and let it sit in the fridge overnight. The muffins were fantastic, less chewy and with a better crumb than store brands. I’m not sure if it mattered, but when I added the milk to the butter and sugar, the mixture was noticeably cold. I chose to heat the mixture on the stove to 120F to ensure the yeast would bloom. By morning, the batter had doubled in size, so I guess it worked. I added the baking soda, but I’m not sure that it was needed since I think I lost some air by mixing it into the batter. Either way, the muffins had noticeable nooks and crannies, and my family loved them! The recipe is going into frequent rotation for weekend breakfasts. I’ve got a bowl of these chilling in my fridge for tomorrow morning. I accidentally added the baking soda and water already, c’est la vie. Anyone have a guess as to if I can add a tiny bit more in the morning, or will that give it an overpowering soda taste? Ok, I made ’em! I had a few minor flubs, including when I coated the bottom of my pan with cornmeal – it burned like a mofo. A sprinkling is definitely sufficient! I didn’t use rings, and for the most part they turned out round (although not nearly as uniform as yours). They taste GREAT; I never knew an english muffin could be so tasty, actually. The dough is a bit of pain to work with, though. I felt a bit like the Griswalds when they were covered in tree sap. I tried this english muffin recipe over the weekend and it turned out pretty well. It’s not as airy as I was hoping (not as good like a Bay’s) but it still tastes good. I’m thinking maybe it needs a bit more baking powder? Could this be due to the Colorado high altitude? Made these on Saturday (11th) and they were a hit. I’ve made English muffins before using other recipes, but this one is my favorite. Served them with poached eggs and Hollandaise; leftovers were toasted. Delicious every way. Thanks for posting. I made a batch over the weekend using an old electric grill. I found 300 degrees to work best – it did not burn the corn meal too much. Maybe a little closer to 8 minutes per side cooked them all the way through. Great taste. Best part is I can make them bigger than the store bought ones and so my eggs Benedicts are bigger and more satisfying. I finally got to make these today. They are great. I usually use the KAF recipe and though they have great flavor, I always ended with a finer crumb and smaller holes. I do like the KAF muffins for burgers!!!! I made the dough the night before and let it rise in my garage (40-45 degrees last night. I then let it rise again as it came to kitchen temperature this morning. My dough ended up thicker than the images above. Perhaps I didnt allow or adjust for some autolyse? (I had to cut them with a ring) They cooked up great! Not quite as airy as I’d hoped but they definately have bigger holes. Next time I’ll work on a wetter dough. The baking powder really helped! Flavor is great. Thanks for this recipe! I halved it and it was still really awesome! Better than anything store-bought. Made these this morning, and they’re delicious! It took some major fussing with the heat, tho’ – I overestimated what “moderate” meant, and the first few came out weird. But after I got the heat low enough, things went swimmingly. Thank you for the recipe! Oh, these are FABULOUS! I’ve made Reinhart’s recipe from The Bread Baker’s Apprentice a few times, and while those are better than anything you can get in a store, THESE are decadent. I love them, my husband loves them – total win! I am definitely going to make again and would love to see a sourdough version. I failed – today I was thinking how fun it would be to have breakfast for dinner. These english muffins looked so good I decided to try them. They came out so flat that my husband actually asked when he saw the table set up “are you making toast or something to go with the eggs”. This was because the muffins looked like panckakes. What did I do wrong?? Was my dough not thick enough, was it the yeast??? Help please I want to make these again, but it would be helpful to know where I messed up. Can’t wait to try these! The Cheeseboard Collective in Berkeley CA ( across from Chez Panisse) makes amazing homemade English Muffins…with a slight sourdough tang. Ummph- delicious! The recipe is in their cookbook; has anyone tried it? No baking soda/powder, but they still have beautiful “nooks and crannies” (the picture on the link above doesn’t really do them justice) and they have a much drier dough, which you can pick up and form by hand rather than pouring into circles. I have made sourdough English muffins that turned out pretty well, though not as holey as I like – they tasted great though. I am going to experiment using your recipe only tweaking it to sourdough to see what happens. I noticed from the pics that your dough is much wetter than the dough from the recipe I used. I am hoping this looseness may make a big difference in the dough’s ability to create the requisite holes. What I will do is combine the butter, egg, sourdough starter (about 1/2 to 1 c.) to the milk, then add that to the flour/sugar/salt (may need less flour), mix till combined and allow it to ferment 8 to 24 hours till it’s nice and bubbly. Just before baking I’ll stir in the baking powder/water mixture and see how it goes. I made them this evening and I like the free form ones best, the ones in the ring were doughy so I needed to bake them to complete the baking process. Overall they were very good, I just want to tweet the baking process and size a little.